If a winter-metal anime adventure from Finland sounds awesome, we kind of agree. If it sounds ridiculous… well, we don’t disagree. However, if you’ve listened to Everfrost, you’ll know that regardless of how silly that line sounds, these guys know their business, and their special brand of anime-influenced power metal is both technical and fun to listen to. This week we snagged mastermind Benjamin Connelly and got the playlist of his life! It would have to be “Dancing Queen” or “Mamma Mia” by ABBA! My dad played a lot of disco stuff then. I started really getting interested in music when I heard “Detroit Rock City” by KISS. I was listening to a lot of Bodom, Turmion Kätilöt, and Nightwish in those times, but the song that brings the most nostalgia from then is “We Are Golden” by MIKA. It was probably “Dark Chest of Wonders” by Nightwish and a mix of all the anime openings I was watching! Definitely “Uhriveri” by Turmion Kätilöt; their new Dance Panique album is catchy as hell! Weirdly I find myself in the nightcore craze on YouTube sometimes. The idea of just speeding up songs and calling them nightcore is kinda silly, but some of it is kinda fun to listen to. I’m also big into Love Live School Idol Project, but I’m proud of that! It was Destroyer by KISS. I was like 10 and their music and imagery amazed me! 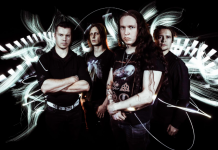 “Lady of the Wind” by Whispered or “Death and the Healing” by Wintersun would go well with some hot glögi and rum! There are many good ones but “Hangover” by Alestorm always goes well in the car or at parties. I guess if I die young then “Happy Ending” by MIKA and if I die old then “The Last Amazing Grays” by Sonata Arctica. Could be fun to play something really brutal though! 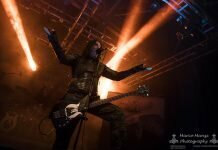 Check out our gallery, report, and interview from their show at Arabia, and keep an eye open for these guys this summer! Or check out their music on Spotify!